NEW YORK (CNNMoney) -- Welcome to the dawn of mobile currency. For years, tech companies have demoed flashy prototypes of systems that let customers use their mobile phones in place of cash or credit cards. This year, those systems are heading out of the labs and into the real world. The result: A gold rush on the next e-commerce frontier. "There's a lot of money at stake if it's done right," says Omar Green, director of strategic mobile initiatives at Intuit (INTU). Starting Wednesday at Starbucks (SBUX, Fortune 500) stores throughout the U.S., the cashier can now scan your phone to deduct payment for your latté from the balance on your pre-loaded Starbucks card. Splitting the dinner bill with a friend? Download Bump, and you can beam over the cash from your PayPal account. Those transactions are small slivers of a global mobile payments market analysts estimate at $69 billion in 2009, the latest year for which data is available, according to research firm Generator Research. But by 2014, it expects mobile payments to reach $633 billion annually, with 490 million customers using their phones to move cash around. The battlefield: The mobile payments space right now is a primordial soup. Both new and entrenched players are battling about fundamental aspects of how the market will work. Issue number one: How many middlemen will there be? PayPal created an empire for itself by making it easy for consumers to send money online to friends and merchants. Rivals like Google Checkout and Revolution Money never gained much traction. The company is determined to extend its dominion. "We are already the leader in mobile payments," says Laura Chambers, senior director of PayPal Mobile. "We're going to continue to innovate, and we're getting very aggressive about mobile payments in the next two years." 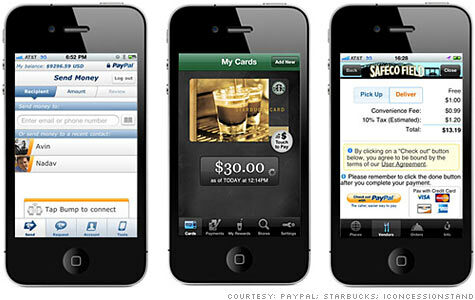 PayPal, a unit of eBay (EBAY, Fortune 500), processed $700 million in mobile payments in 2010, according to Chambers. While that's a small fraction of the more than $70 billion a year PayPal handles, it's an increase of almost 500% increase over the prior year's $141 million mobile total. PayPal's platform is an easy one for developers to build on top of, and the company has been actively striking integration deals. But PayPal sits in the commerce market's shaky middle ground. It doesn't control the financial network payments run through -- that's in the hands of companies like Visa (V, Fortune 500) and MasterCard (MA, Fortune 500) -- and it doesn't control the devices consumers use, or the data networks their transactions happen on. The companies that do control those things are determined to get their piece of the action. Three of the nation's biggest wireless carriers -- Verizon Wireless, AT&T (T, Fortune 500) and T-Mobile -- teamed up in November to create Isis, a new mobile commerce network the carriers hope to have up and running within 18 months. Working around the Visa/MasterCard duopoly, they picked Discover Financial Services (DFS, Fortune 500) as their financial services partner. Banking giants Visa, Bank of America, JPMorgan Chase, and Wells Fargo have also been testing technologies that would transform a smartphone into a wallet. What happens next: The looming game-changer in mobile payments is a technology called "Near Field Communication" (NFC), which swaps data over very short distances. Put a NFC chip -- for example, one built into in your smartphone -- near an NFC reader and you don't need to awkwardly scan a bar code on your phone or send a text message to transfer money. Key mobile players are on board. Just months ago, Google CEO Eric Schmidt said that the next version of Google's Android would include tap-and-pay functionality and "could replace credit cards." Apple recently hired an NFC product-development veteran to lead its mobile commerce efforts. "The lifecycle of a phone is fast: 18 months. If some of the big players -- like Apple, RIM, Google and Motorola -- all get going with NFC, it could be a standard within two years," says VeriFone CEO Doug Bergeron. Developers are currently kludging together workarounds. Startups like Blaze Mobile and Bling Nation are pushing stickers with embedded NFC chips. Slap one on your phone, and you can use it to pay at participating merchants that have installed compatible NFC readers. That's where VeriFone (PAY) comes in. The 30-year-old company makes point-of-sale systems that are used by millions of U.S. merchants. VeriFone is experimenting with the pay-by-phone market, striking partnerships with many of the field's pioneers, including PayPal and Bling Nation. "We're going to play the role of Switzerland," Bergeron says. "The more the merrier in our view." The scramble: In a year or two, NFC technology will be more widespread. Isis will be closer to launching. The battle lines will harden. But for the moment, it's anyone's game. "There's no cut and dry 'this is how to do it' approach," says Nick Holland, a Yankee Group senior analyst. "In the U.S., it's going to be the Wild West, since anyone can play in this space." Quick-moving startups are charging in. Last week, investors poured $27.5 million into Square, a venture launched in 2009 by Twitter cofounder Jack Dorsey. Square lets mobile merchants accept credit-card payments on their phones. Venmo is another startup the tech world is buzzing about. It allows users to text each other money -- and just like PayPal did a decade ago, it's actively cultivating a developer ecosystem of apps built on top of its platform. "There's a lot of time for these smaller players to make some noise," Intuit's Green says of the scrum. Holland predicts there will be much noise before clear winners emerge: "There's going to be quite a lot of fragmentation." We're still in the early days, and it'll be years before smartphones are ready to completely wipe out cash and credit cards. But don't be surprised if sometime this year, you find yourself handing over your iPhone to pay for a Frappuccino. Twitter's Dorsey: Fixing credit cards with Square.